Saint James the Brother of God was the first Hierarch of Jerusalem. He was the son of Joseph, the betrothed of the Most-Holy Theotokos, by his first wife and was considered by the Jews as the brother of the Lord. Besides this, he was called the Brother of God for the following reasons: "First, for his wonderful state of being and many virtues, on account of which he was also called 'Just'. Second, because he was not numbered among the chorus of the Twelve Apostles and did not have the privilege to be called an Apostle, he was thus given the privilege of being called 'Brother of God'. 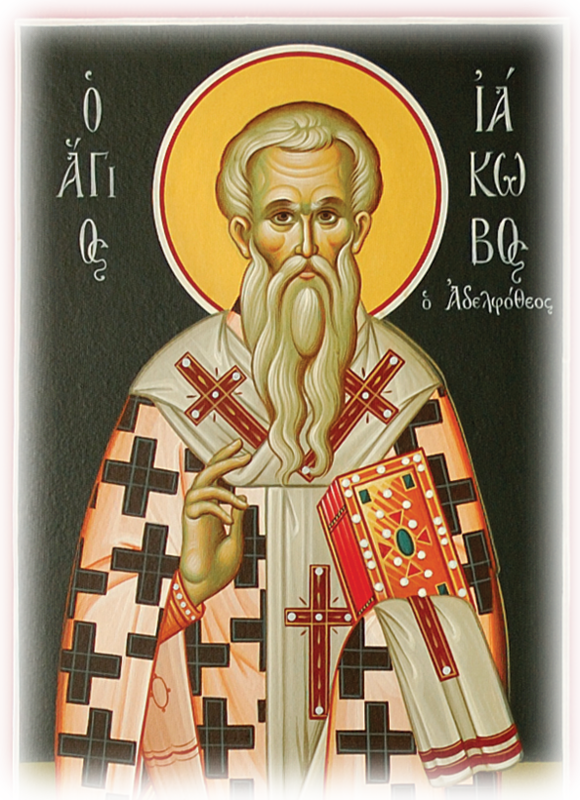 Third, he made Christ an heir to share in the paternal estate, while the other three brothers refused to do the same" (St. Nikodemos the Hagiorite, The Seven Catholic Epistles). He was honored more than all of his brothers, which is shown by what the sacred Chrysostom says about the relatives of Christ according to the flesh. That is, he was called by all believers "Master" (Bishop), and Saint James is "considered the first Master of all" (op. cit.) He was honored also by all the Apostles, and his opinion was taken into serious account, as witnessed in the Acts of the Apostles. The only letter he wrote he did not send to the faithful of a particular local Church, but to all the faithful of the universe, to all the Jews who believed in Christ and were scattered in every part of the world, which is why it is called a Catholic (Universal) Epistle. "In this letter he teaches, first, the differences between temptations: which temptations occur to man through the concession of God and which ones through man's desire. Second, that Christians should show their faith not only with words but especially through works. Third, he orders that the rich should not be preferred in the Church above the poor, but rather to rebuke the rich as proud. Fourth and last, while the Saint comforts those who suffer injustice and motivates them towards forbearance and to be patient until the Second Coming of Christ, he sets forth before them Job as an example of the usefulness of patience, and instructs the sick to invite the priests to anoint them with oil. And all believers should strive to bring the way of truth to those who have been deceived, because to them is given payment from the Lord, which is the remission of sins" (op. cit.). Saint James wrote the first Divine Liturgy, which is devout and preserves the way of worship of the first Christians of Apostolic times. It is celebrated today, the day of his feast, but also on the second day of Christmas. The Brother of God James, according to Saint Theophylact, was called "Less" in contrast to the Apostle James who was the brother of Saint John the Evangelist, who was called "Great" because he was numbered among the Twelve Apostles. "Some women were watching from a distance. Among them were Mary Magdalene, Mary the mother of James the Less and of Joses, and Salome" (Mark 15:40). The second Mary mentioned is the Theotokos, who is called the mother of James and Joses. The end of his life was martyric. Because of his divine zeal he led many to the knowledge of God, so the Jews threw him from the pinnacle of the Temple, and when they saw him still alive they stoned him to death. The letter of Saint James the Brother of God is an amazing text that brings true consolation and unspeakable joy to the soul and repels all forms of despair. It sets forth the best way of interpersonal relations. It stresses that people should not be divided into groups depending on the money or status they hold, but they should demonstrate to all the same respect because they are icons of Christ. It indicates the way of purification, the healing of the soul of the passions, so the nous can be illumined and man can gain personal knowledge of God. He does not fail to stress the value of the presence of the Priest - the Healer - and the use of tangible matter, such as oil, which is sanctified and through it the uncreated Grace of God acts. He also speaks of human wisdom and contrasts it with the wisdom that "comes from above", which he calls pure, peaceful, lenient, deferential, full of compassion and good fruit, impartial and sincere, because it is free from the passions, which cause strife, fights, messiness "and every vicious thing". There are those who are wise according to God and those wise according to the world, but there are also those who possess both types of wisdom. Besides, human wisdom enriches the intellect, while the enhypostatic wisdom of God, which is Christ Himself, enriches the heart with uncreated Divine Grace and is graced with all the goods longed for by man and are listed by the Apostle Paul - love, joy, peace, etc. By reason a person understands the letter in the way they hear it or read it, but with an illuminated nous they have the ability to penetrate the depth of what is said or read and in this way understands the spirit of the text and its deeper meaning in order to interpret it correctly. The study of the life and letter of Saint James helps the believer to be inducted into the perspective of therapy, whereby they will acquire the true knowledge of themselves, the empirical knowledge of God and true communion with our fellow men. Source: Ekklesiastiki Paremvasi, "Άγιος Ιάκωβος ο Αδελφόθεος", October 2004. Translated by John Sanidopoulos.